On the 20th October 2014 I was scheduled to spend an entire day “deconstructing” the Charles Heidsieck Brut Réserve with Thierry Roset, its softly spoken chef de caves. 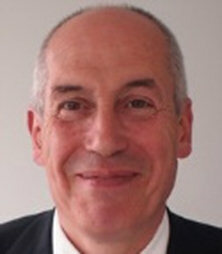 We were to be joined by Dr Tony Jordan. It was something that Tony and I had talked about for years and finally it was about to happen. We could not wait, but it was never to be. Thierry Roset, an intensely private, warm-hearted and truly gentle man, died suddenly of an aneurysm at his home in Reims on Sunday 5 October at the age of just 55. There are more photogenic representations of Thierry Roset, but of all the available photos, this one speaks to me of his warmth of personality. It is how I would like to remember him. 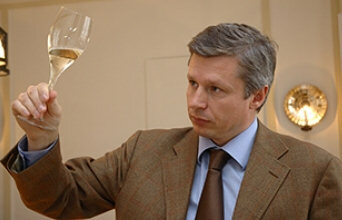 Born 4th January 1959, Thierry spent time training at Moët & Chandon, Charles Heidsieck and Louis Roederer. In 1978, he received a Diplôme en Viticulture & Oenologie from VITI Campus in Avize, and in 1983, while working at Louis Roederer, passed the Diplôme Nationale d’Oenologue at the University of Reims. In 1985, while training at Charles Heidsieck, Thierry first met the legendary Daniel Thibault and participated in the blending of such iconic Champagnes as the Blanc des Millénaires 1985 and Champagne Charlie 1985. Those who knew Thierry will tell you that it was from this juncture that he was hooked on Charles Heidsieck, and although he moved to Moët & Chandon to further his experience, it was not long before he would return to Charles Heidsieck, to accept the post of one of Daniel Thibault’s assistants in 1988. When Daniel Thibault died in 2002, Régis Camus took over as head of viticulture, approvisionment and winemaking for both Charles and Piper-Heidsieck. Thierry continued to manage the cellar, riddling and disgorgement operations for both brands, as he had done for the previous 10 years, but in 2003 he was given special day-to-day responsibility for Charles Heidsieck. He continued managing the cellar operations for both brands, but was encouraged to focus his creative attention on Charles Heidsieck, while Régis remained in overall control of both brands, but was able to concentrate his energies on increasing the range, quality and reputation of Piper-Heidsieck. Thierry Roset was not just a safe pair of hands; he was, for example, the major influence in restructuring the Brut Réserve in 2007. This was and still is the most consistent non-vintage in Champagne, something that many other Champagne producers will gladly concede. The creation of Daniel Thibault, the master blender of all master blenders, Charles Heidsieck Brut Réserve is the last Champagne that anyone should tamper with. It not only worked, it worked better than anyone else’s non-vintage, so why mess with it? Yet that is what Thierry did. He did not make a better wine, he achieved something much more difficult: he replicated the quality and style with a radically different blend. It still boggles my mind, but Thierry used a new bottle-shape, the so-called crayères bottle, which reduced oxygen transfer, slowing the maturation process; he reduced the number of crus by half (from 120 to just 60 crus), placing more emphasis on Oger (for Chardonnay), Ambonnay (for Pinot Noir), and Verneuil (for Meunier), the three crus that have always been at the crux of this cuvée; and increased the age of the 40 percent reserve wine from eights year to between 10 and 15. Since the crayères version of Charles Heidsieck Brut Réserve was released in 2012, three different blends have seamlessly maintained the consistency that Daniel Thibault established and Thierry Rosset so skilfully replicated. No chef de caves works on his or her own. They all have teams, including the late, great Daniel Thibault, who depended on others, including Régis Camus, his number two from 1994 until his death in 2002. So, just as Régis does not detract from the achievements of Daniel Thibault, so Thierry does not detract from the achievements of Régis when I say that for years he was the unsung hero of Charles Heidsieck. Thierry was for all intents and purposes the chef de caves, but he was working completely in the dark as far as the outside world was concerned. However, within just nine months of the new owners EPI appointing Cécile Bonnefond to the post of Président of both houses, she recognised his importance to Charles Heidsieck by officially promoting him to chef de caves in April 2012, something the previous owners should have done long ago. Thierry might have had very little time in the limelight to benefit from the recognition he so richly deserved, but without the swift action taken by Cécile Bonnefond, he would have passed away unknown and unappreciated. Of all the management decisions she has taken in her life, this is one she should be most proud of. And like all the best management decisions, it benefited the company as much as the individual because Thierry’s appointment was not only an overdue recognition of his contribution, talent and potential, it also served to differentiate between the Piper-Heidsieck and Charles Heidsieck. Régis Camus was still in charge of the winemaking teams for both brands, but Thierry’s appointment put a face to the wines of Charles Heidsieck. Now, sadly, another face will have to be found. It is easy to believe this story, that Roederer could be seen as a ‘school’ because the first time I walked around the cellars with Michel Pansu must have been in the early 1980s, when Thierry would have been doing his internship. If I saw him there, I cannot truthfully say, but I remember the didactic Michel Pansu, tasting from barrels and discussing the wines with me. Well, he did not actually discuss the wines, he listened to my opinion then scribbled on the casks one of just three comments: ‘grand’, ‘bon’ or ‘peut mieux faire’ (could do better), expecting me to learn from his silent assessment of my own opinion. Had I worked there, I would indeed have thought of it as school! Thierry was an intensely private man who loved listening to music. He had a particular passion for the Blues, and enjoyed playing the guitar. Thierry leaves his wife Laurence and three sons Paul, Tom-Louis and Martin-Pierre.